What Happens After Submitting the Form I-130? Within 2-3 weeks of submitting your I-130, you should receive a Notice of Action (also known as Form I-797). It is vital that you read the information on this notice, as it will tell you if your I-130 has been received, rejected, or requires more information from you. The Notice of Action will contain a priority date and a receipt number can be used to check application status. If you haven’t received a Notice of Action within a few weeks, you should make an inquiry here. parents of citizens 21 years of age or older. USCIS issues an unlimited number of immigrant visas (green cards) to Immediate Relatives. Thus, processing time is faster for Immediate Relatives than other relatives. Congress permits a limited number of Family Preference visas per year. Therefore, people who fall into this category often wait longer for a visa number to become available. Priority depends on when the I-130 was submitted. The wait time can be anywhere from 6 months to 6 or more years. Once your I-130 is approved, you are permitted to file for a green card and therefore obtain lawful permanent residence. The filing process depends on relative status and where you are currently living. Inside the US: Immediate relatives inside the US can submit Form I-485 (Application to Register Permanent Residence or Adjust Status) while the U.S. citizen petitioner files Form I-130. Relatives may file I-485 applications any time after a Form I-130 has been submitted if it has not been denied, although relatives must submit a copy of their Notice of Action along with Form I-485 in order to prove that Form I-130 is in process. Outside the US: Immediate relatives outside the US obtain green cards through consular processing. The USCIS will work to schedule a visa interview with a U.S. consulate in the relative’s country. The Department of State will notify the relative when he or she is may apply for an immigrant visa, which must be applied for within one year of this notification. Once the Department of State issues an immigrant visa, the relative may travel using the visa and will obtain permanent residency when they reach a U.S. port of entry. 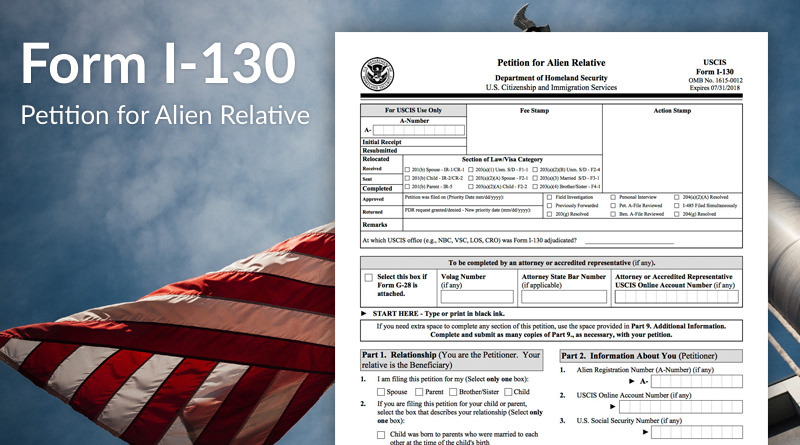 Inside the US: Once Form I-130, Petition for Alien Relative, is approved, one must wait for the priority date in one’s immigrant visa category to become current (see the date listed in the Notice of Action, and check when it is current by adjusting the following June 2017 URL to reflect the current month and year uscis.gov/visabulletin-Jun-2017). When the date listed is current, it is time to file Form I-485, Application to Register Permanent Residence or Adjust Status. This is the required form for becoming a Permanent Resident. Outside the US: Family Preference relatives outside the US also obtain green cards through consular processing. See those details above. In most cases, children’s ages are “frozen” as the ages listed when Form I-130 was filed. If unmarried children of U.S. citizens get married before obtaining green cards, they may cause serious delays in processing. Children of U.S. citizens must notify USCIS of any change in marital status after submitting Form I-130. Rachel is a Political Science student at Brigham Young University with research interests that include international development, American politics, and political philosophy. She formerly worked for Sirius XM news radio show Top of Mind with Julie Rose as an assistant producer. Rachel enjoys hiking, sailing, and spending time with her family.